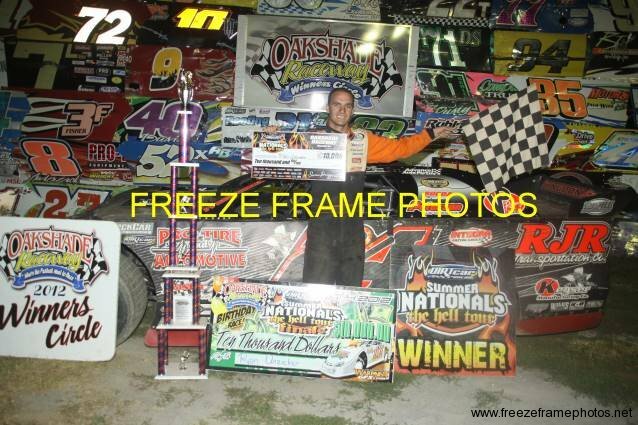 Devin Shiels from Adrian, Michigan, picked up his first UMP Late Model feature victory at Oakshade Raceway on Saturday night while Jeff Foks collected the Hot Rod Welding Bomber A Main win. 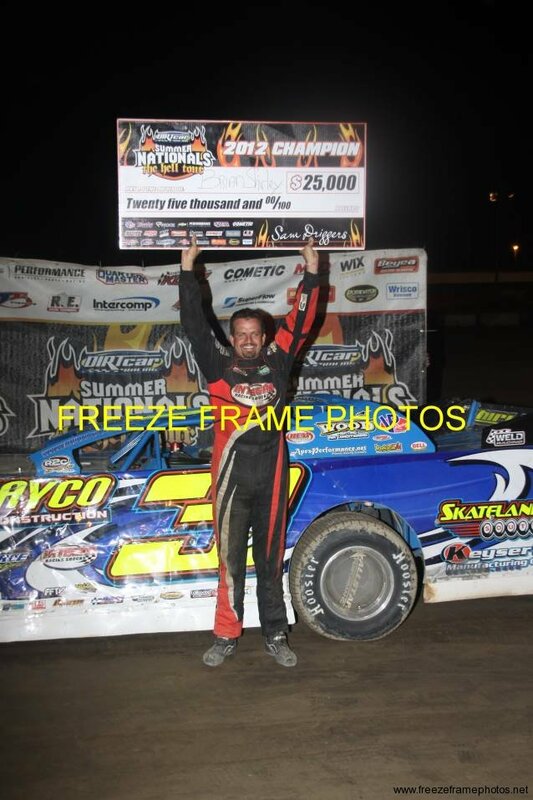 Hot Rod Welding added an extra $100 to the pay out for the winners of each of the UMP Bomber feature events. Phil Ausra got the jump on Kevin Reeve at the start of the UMP Late Model feature race to lead the first handful of laps. Brian Ruhlman quickly closed in and took command of the race on lap six and then pulled away. Unfortunately for Ruhlman, he wouldn’t make it to the end. While under a lap 13 caution, Ruhlman’s car rolled to a stop and had to be pushed back to the pits. That turned the lead over to Devin Shiels. Shiels proceeded to open up a sizable lead until a caution flag flew with two laps remaining for Chris Keller who lost power and could not make it back to the pits. Shiels was able to hold off Phil Ausra and Dan Wallace for the win. Rusty Schlenk finished fourth with Casey Noonan fifth. Next up was the 20-lap Hot Rod Welding UMP Bomber A Main. Craig Dippman got together with Adam Noonan in turn two sending Noonan into the wall which brought out a caution flag and resulted in a complete restart. Dippman once again had issues in turn two and crashed head on into the backstretch wall ending his night. Once racing finally resumed, Curt Lancaster was the early leader. Jeff Foks worked his way up to challenge Lancaster and took the lead on a lap five restart. Multiple caution periods kept the field tight. Lancaster tried to stay with Foks and Terry Rushlow joined the battle for the lead late in the race. Neither Rushlow nor Lancaster could keep Foks from earning his eighth UMP Bomber A Main win of the year. Rushlow finished second followed by Lancaster, Jeff Geis and Gregg Detray who started 18th. Matt Lindsey and Bruce Stuart put on quite a show in the UMP Sportsman feature race. The two drivers were side by side for the lead for the majority of the event, but it was Matt Lindsey with the early edge. Stuart began applying the pressure on lap two. Lapped traffic became a factor for the leaders and they continued their battle while working through the slower traffic. Eventually Stuart got the lead and won his second feature of the year. Lindsey faded back in the final few laps allowing Mike Jessen to finish second and Tim Fisher third. Finishing fifth behind Lindsey was pole-sitter James Fox. After disappointment a week ago in the Hornet feature, Cody Laney led from flag to flag to pick up his first ever feature win. Last week, Laney fell off the pace while leading and did not finish. This week he was able to hold of challenges from both Maverick Wright and Drew Smith. Wright ended up taking second with Smith in third. Josh Froelich finished close behind in fourth and Cara Robinett wound up fifth. Trent Delong extended his win streak to four in the UMP Sport Compact class with another victory over Derek Morris. Morris once again tried to find a way to get alongside the 3D car of Delong, but could not make it happen and had to settle for third. Regan Ford finished third. Tim McNicol took the lead at the drop of the green flag in the Hot Rod Welding UMP Bomber B Main but got all crossed up in turn four before finishing the first lap. Scott Robertson did lead the first lap and then battled three-wide with Greg Whitehead and Marty Bloomer. Whitehead came out of that exchange with the lead on lap two and began to pull away from Bloomer in second. Bloomer gave up second position after spinning on lap four. More caution flags kept the field tight behind Whitehead who held off Justin Gamber after a late caution set up a one-lap race to the checkers. 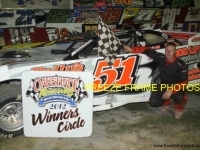 It was the first feature win for Whitehead. Donovan Paskan finished third behind Gamber after starting at the very back of the field. 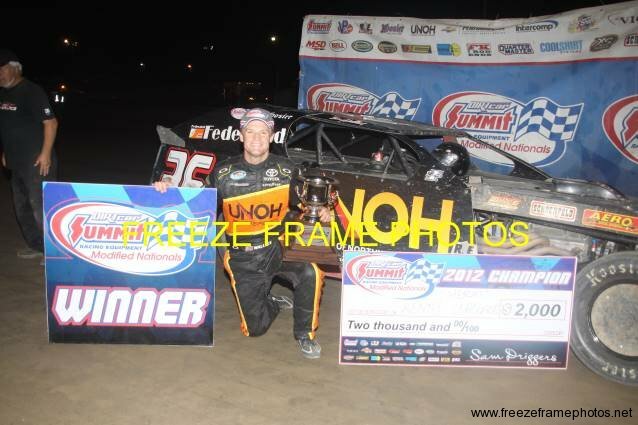 Nick Fenner also started deep and climbed to finish fourth with Shaun Sharp finishing fifth. The most exciting finish of the night was in the Hot Rod Welding UMP Bomber C Main. Perry Cox gave up the early lead when he spun on lap two turning things over to Chuck Faller. Brandon Clark from Lyons, Ohio, got by Faller for the lead on lap four. Jake Gamber pressured Clark late in the race and got alongside Clark on the final lap. Clark had a slight advantage, but the rear end on Clark’s car kicked out just a bit coming off turn four allowing Gamber to get a good run to his outside. The two drivers crossed the line in a near photo finish, but Clark had just enough advantage to become another first time winner. Gamber was second followed by Perry Cox, Chuck Faller and Charles Stuckey. The UMP Sportsman class will have two full 25-lap feature events on Saturday, July 28 at Oakshade Raceway in the annual Sportsman Twin 25’s. UMP Late Models, UMP Bombers, Hornets and UMP Sport Compacts will also be in action. Gates open at 4pm with racing at 7pm. The annual Birthday Race weekend at Oakshade Raceway attracted racers from at least nine different states and Canada. 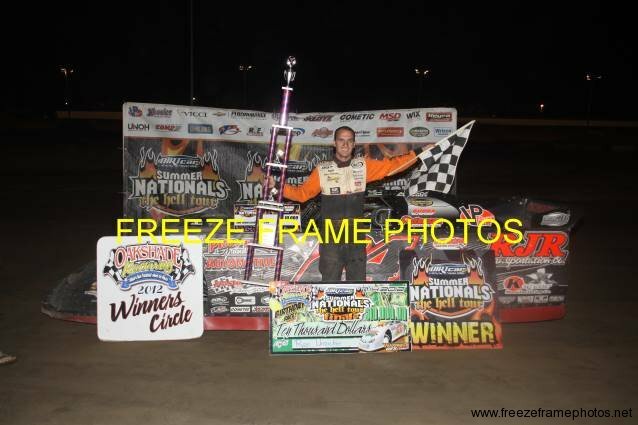 Fans from all over packed the stands to watch an exciting UMP Summer Nationals finale with Ryan Unzicker and Brian Ruhlman picking up feature race wins and Brian Shirley and Kenny Wallace both earned Summer Nationals titles. Fifty-six UMP Late Model teams battled to make the 22-car starting line-up for the 60-lap Birthday Race/Summer National finale feature. After a slight delay due to a quick rain shower, the green flag dropped on a caution-free main event. Summer Nationals points leader Brian Shirley started on the pole and maintained the early lead. A hard-charging Brandon Sheppard from New Berlin, Illinois, quickly closed in and took the lead on lap 12. Sheppard had set a torrid pace earlier in his heat race win, running laps almost a half second faster than fast qualifier Jason Feger’s time. Sheppard appeared to be on his way to a $10,000 win after pulling away from the rest of the field running the high line through the turns. Without the help of any caution flags to tighten the field, Ryan Unzicker slowly began to reel in Sheppard as they worked through lapped traffic. It wasn’t until the last 10 laps that Sheppard’s lead quickly evaporated. Unzicker, who likes to run the low line around the corners, got alongside Sheppard and took the lead on lap 56. The two drivers battled side by side a couple laps through some heavy lapped traffic. 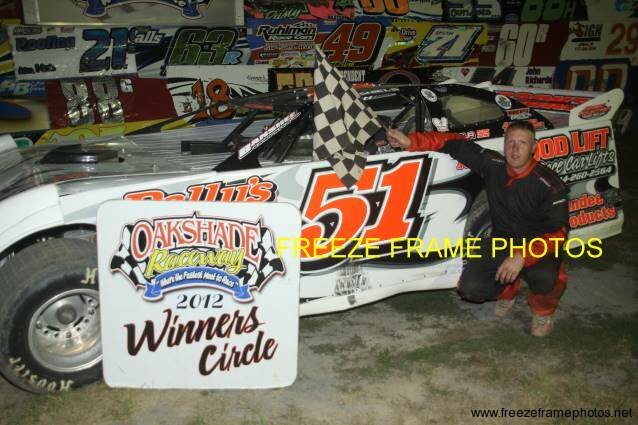 Unfortunately, Sheppard caught the wall just a bit coming off turn two which allowed Unzicker to pull ahead and take the checkered flag to become the 2012 Oakshade Raceway Birthday Race winner. Sheppard was disappointed to finish second after leading the vast majority of the race. Matt Miller started tenth and climbed to a third place finish followed by Jeep Van Wormer in fourth. 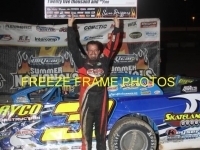 Brian Shirley’s fifth place finish was enough to capture the 2012 UMP Summer Nationals Championship as “The Hell Tour” came to a close after nearly a month of continuous racing. 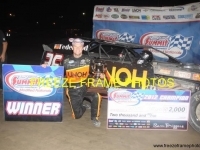 Kenny Wallace decided to run for the Summer Racing Equipment Modified Nationals championship at 7am Saturday morning and had Tony Stewart fly him out to compete with 40 other Modified drivers. Sitting second in points behind an absent Mike Harrison, he just needed a 16th place or better finish to earn that championship. Things looked good early in the 25-lap feature for Wallace who started on the outside of the front row and got the early advantage over Zack Olger. Jake Ruefer charged toward the front and took the lead from Wallace on lap 16. Clarklake, Michigan’s Brian Ruhlman had his car hooked up on the high side and got by Wallace for second. Soon after taking second he then began to challenge Ruefer for the lead. A spin by Collin Thirlby on lap 19 brought out the caution flag forcing Ruhlman to restart behind Ruefer. After the restart, Ruhlman went back to work on the high side and took the lead three laps later. Ruhlman went on to pick up the $1,000 pay day for the win. Ruefer finished second followed by Jacob Poel, Zach Schroder and Zack Olger. 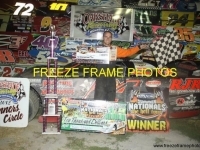 Wallace slipped back to finish sixth his first time at Oakshade Raceway, but earned the Summit Racing Equipment Modified Nationals Championship. Brandon Myers from Morenci, Michigan, started on the pole of the Hornet feature event and led the entire distance. William Cundick and Drew Smith made him earn the victory as both drivers raced him hard. 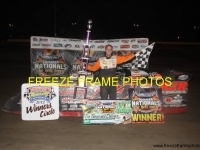 Myers fended off the challenges and picked up his second feature win of the year. Smith edged out Cundick for second. Maverick Wright finished fourth with Devon Bell ending up fifth. After taking the week off, the UMP Sportsman, UMP Bomber and UMP Sports Compact divisions will be back in action along with UMP Late Models and Hornets for a full show in addition to the Hot Rod Welding “Make-up Bomber Race” at Oakshade Raceway. Gates open at 4pm with racing at 7pm.